A friend mentioned she was going to do Tuesdays Topic (traveling) on her Blog, that got me to thinking about traveling. I have some fond memories related to travel. My Grandpa lived with us when I was a kid, way back when. He loved to travel. He’d get the 60 days for 60 dollars bus passes and travel all over the country. I have a scrapbook filled with postcards sent from all the places he stopped. Grandpa was a neat guy to send me so many postcards. Even when he wasn’t traveling, he still loved travel. In those days, the Minneapolis public library had a movie theater and would show a travelog film on Wednesdays. Sometimes he’d take me along, we’d catch a bus and go downtown, it was so cool. The library also had a museum in the basement, what a fun place to explore. It was always a great day to go downtown with Grandpa. I found a photo of me with my first bicycle, it was brand new to me, a freshly repainted 20 incher. 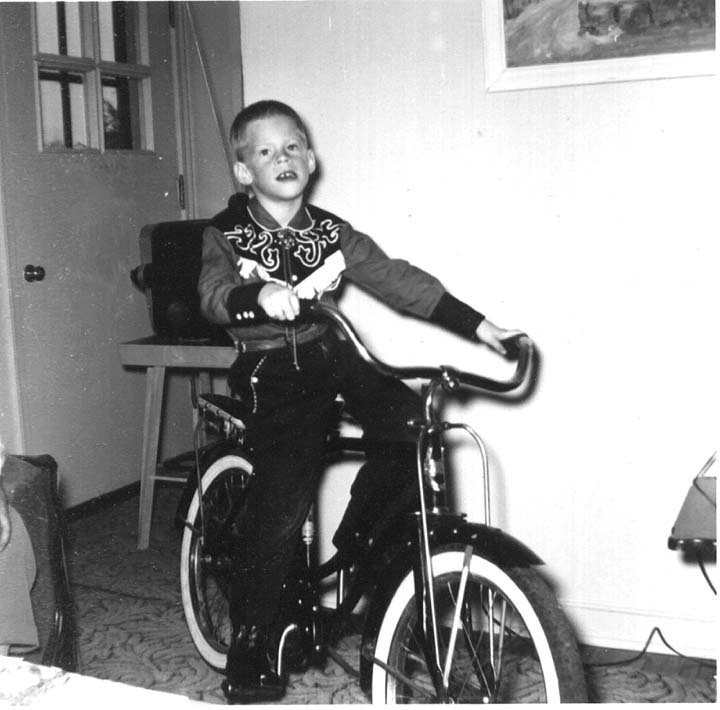 1964 was a good year… Cowboy boots and shirt plus a bicycle! Oh… The good memories. I did lots of traveling and put many miles on that bicycle! Thank you Jen for bringing up Tuesdays Topic and giving me a smile with fond memories! This entry was posted in Tusesdays Topic and tagged traveling, Tuesdays Topic. Bookmark the permalink. Oh great blog, thanks so much for sharing – That’s an awesome photo! – You’re traveling thoughts for the day are definitely more fun than mine turned out.. ha! Thanks for the comments. Glad you arrived safe and sound even if your trip didn’t go as scheduled. Agree with jgoode, thats a great picture.. I even had a bicycle, which on which I rode across the country.. such fond memories..
How is it that we all looked alike in 1964. I think you must be slightly older than me but we all had the same hair cut and wore the same clothes and had the same bike… Thanks for the trip down memory lane. Yes old thoughts and specially pictures gives a nice feeling and takes us to our past. Your past also pulled me in my past for few moments.